Whatever your backup or sync scenario, ChronoSync Express has got you covered! Open Preferences in ChronoSync Express. Choose which agent to connect to from the "Connect to" menu. You can also choose to enter an internet address. In ChronoAgent, on the destination Mac, the internet address can be found under the "Status" panel. You would use an internet address if ChronoAgent is not available on the local network or is on another subnet of a local network. Provide the Username and Password you chose when you set up ChronoAgent. If valid, click on “Next” to set up the Advanced connection profile features. Set whichever Advanced options you'd like. For a thorough explanation of them, click on the Help button to visit the ChronoSync Express help. When finished, click on “Next” to set up the connection profile Mappings. Set your user Mappings. For a thorough explanation of Mappings, click on the Help button to visit the ChronoSync Express help. When finished, click on “Save” to save the profile. Now you’re ready to connect and backup to it. 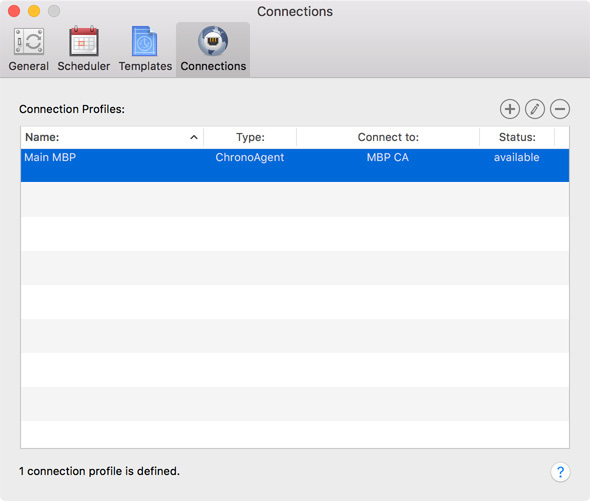 On the Destination pane, choose the ChronoAgent connection you just created from the "Connect to:" menu. Click "Choose..." to select the target on your ChronoAgent Mac. Click the double arrow in the middle of the Setup panel (or choose 'Synchronize' from the toolbar) to perform the synchronization. That's it! You have now synchronized your Documents folder between your two Macs!